Add a splash of color to your outdoor space with the Mainstays 9′ Market Umbrella. It sets the tone for enjoying summer days outside with friends and family. 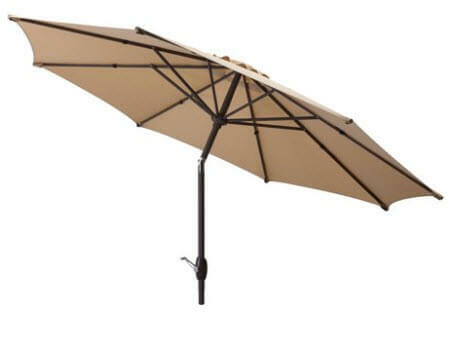 Suitable for the deck or patio, this tan market umbrella features a polyester canopy that provides plenty of shading. It comes with an easy open crank, making it simple for you to open and close it whenever you desire. The Mainstays umbrella also has a convenient three-way tilt for precise placement. With a steel frame, it brings a durable style and long-lasting protection to your back yard. It makes for an efficient way to keep your family and guests comfortable any day of the year.